The collar was an intricate and elaborate affair in Elizabethan times. For once, women followed a male trend. Collars became fashionable and bigger and frillier. This Elizabethan collar came to be known as the ruff. This was the gift to fashion from Elizabethan period. 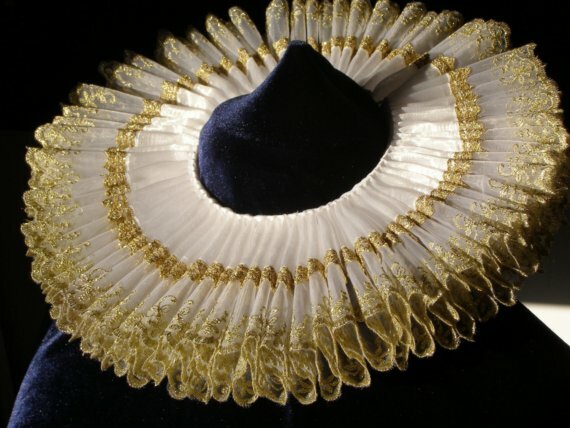 Ruffs were also known as ruffles. Initially, they were just collars, a little high and frilly, but collars nonetheless. Since, women were prone to effeminising accessories, ruffs were changed by Elizabethan women. A small opening was cut in front of the ruff to show off the neck and a little bit of the breasts. The material was shifted to gauze so that the ruff remained stiff and raised behind the head. This also led to a change is hair styling trends among men and women. The men started wearing their hair short, whereas women styled their hair into buns or chignons. These were not made with the main garments but were sewn onto the gown or partlet. A purl was the fold or pleat of the ruff and was often lined with lace or other such trimming. The sleeves also began boasting of ruffs, although these were smaller and narrower. Band strings, which was a lace or string which was used to tie the two ends of the open ruff. Ruffs were made of numerous types of linen, usually costly and fine one. Men wore white ruffs which ended in points. To keep the ruffs stiff and unmoveable, the material was starched. They were fixed with pins or some support so that they do not fall. Eventually, ruffs came to be layered. They were lined with lace, silk, silver and golden threads. 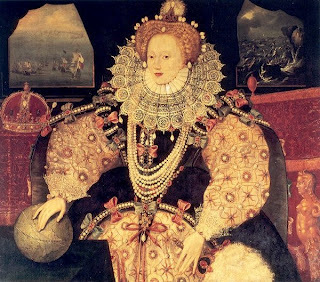 Elizabethan women often affixed stones and gems on them. The upper classes and nobles began wearing bigger and bigger and more elaborate Elizabethan ruffs. The ruff graduated from a mere accessory to a vital part of the clothing. You can make a ruff by taking a needle, thread, ribbon and around a yard of cloth, preferably linen. Take cloth measuring five times around your neck stitch the ribbon the cloth making sure, the ribbon is scrunched together, every other stitch to give it a pleated look. The scrunches should not be haphazard but neatly overlying like a flat flower. Do this until the entire length is done. The ruff can now be pinned to the shirt or partlet. You may use coloured ribbons, lace or beads to make it look festive.